Posted: January 27, 2013 2:00 a.m. 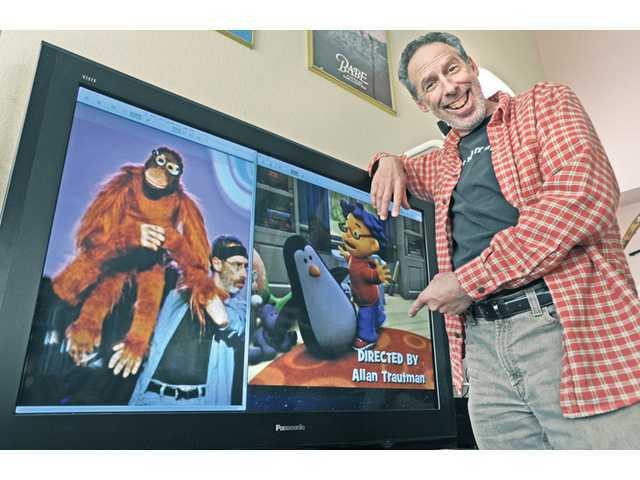 Updated: January 27, 2013 2:00 a.m.
Actor, director and puppeteer Allan Trautman displays some of his credits on the screen. 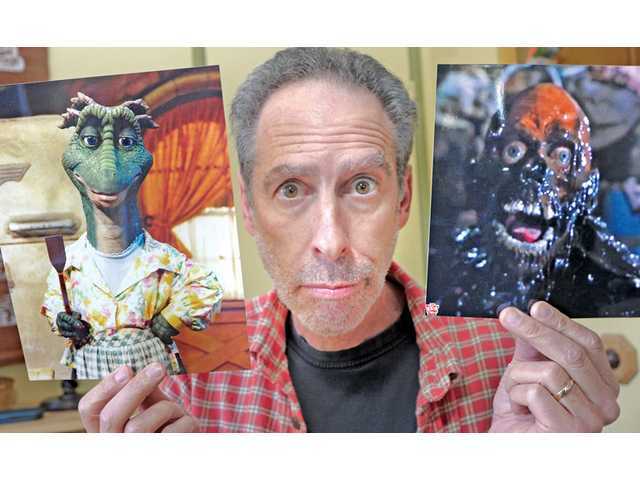 Trautman with photos of two of his characters — the character of “Fran” from the 1990s TV show “Dinosaurs”, left, and “Tarman” from the horror feature film “Return of the Living Dead.” Trautman will sign autographs next weekend in Atlanta for “Tarman” fans. Actor Allan Trautman, of Saugus, has a cult following. His most famous character may be “Tarman” from the “Return of the Living Dead” films. “It was an original film and it sort of redefined the zombie genre,” Trautman said. Released in mid-1980s “Return of the Living Dead” started to achieve cult status in the mid-1990s. Trautman was surprised at the staying power of the horror films. “It wasn’t really until about 10-15 years later that the film received this cult status,” he said. He said the experience of making the film wasn’t exactly fun. “I was a stuffed into a full-body suit, it wasn’t exactly a pleasant experience,” he said. Trautman said he his next convention appearance will be at the Days of the Dead convention Feb. 1-2 in Atlanta. Trautman was born in Brooklyn, N.Y. and moved to the Santa Clarita Valley in 1976 when he attended the California Institute of the Arts in Valencia. “I got my master’s degree in acting from CalArts,” he said. Trautman got his start as an actor while attending Washington University in St. Louis as an undergraduate where he received degrees in physics and drama. Trautman also holds a teaching credential in high school physics. “I’ve always been interested in science, what makes things work and how things tick,” he said. After CalArts Trautman ventured into the world of stand up comedy with fellow CalArts actor Don Lake. “We gave that up after a couple of years when we saw it wasn’t going anywhere,” he said. Trautman worked at Leo’s Stereo for four years after CalArts as he found his way in the entertainment industry. At the same time he was making contacts with the professional puppeteers in Los Angeles. He found the job the very first day he started looking for acting work by finding an audition notice posted on the board outside the theater office. Trautman is still amazed at his luck in finding his life’s work. “I was very, very lucky. The fact that they were willing to train, that they were casting on the very first day that I went to look, if I had gone a week later it would have been gone,” he said. His big break in Los Angeles came in 1980 when a friend alerted him to a potential job with Sid and Marty Krofft. “They were looking for puppeteers and starting a puppet school,” he said. After his first reaction — “I don’t need a puppet school, I know how to do it,” — he realized that he wasn’t doing anything else so he might as well check it out. The “puppet school” opened doors for Trautman and he worked on several projects with the Kroffts including a children’s show with Richard Pryor and other projects. In addition, Trautman found other small jobs that allowed him to practice his acting craft. The Kroffts sent him on a tour during the summer of 1982 that allowed him to leave his job at Leo’s Stereo. The 1990s were busy for puppeteers, Trautman said. He found work with the Jim Henson company on the “Jim Henson’s Muppetvision 3D,” which is shown at Disney’s California Adventure Park. Trautman met Jim Henson, the creator of the Muppets, when working on the 3D project. Trautman first worked with Henson in February of 1990. In May, 1990 Henson died at age 53 of a severe streptococcal infection. Henson never lived to see his final project, the popular television show “Dinosaurs,” on the air. Trautman worked on the show, a collaboration between Henson and Disney. After “Dinosaurs,” Trautman got a call to operate the puppet “Mr. Floppy” on “Unhappily Ever After” — a new show debuting on The WB. The show lasted 100 episodes. The introduction of advanced computer graphics in film and television has seen some job opportunities for puppeteers vanish. “There are few big, big puppet jobs anymore,” he said. However, the art of puppeteering is still in demand, especially in the theater where shows like “Ave Q” and “Stuffed and Unstrung” have found large audiences. 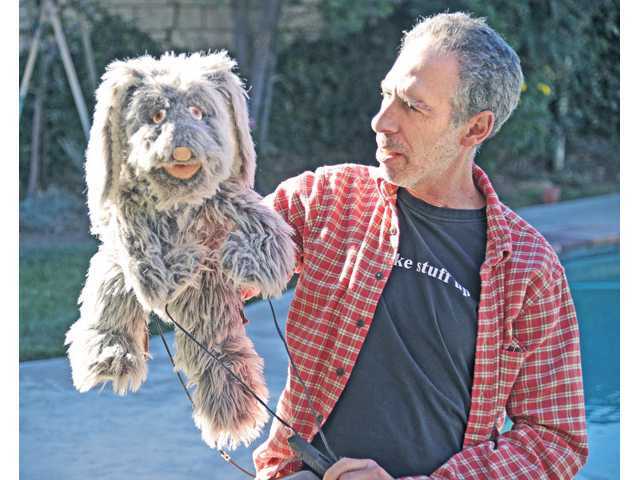 Trautman has toured with “Stuffed and Unstrung” — described as an improvisational puppet show for adults. When film and television work is slow, Trautman fills his time teaching at College of the Canyons. He will be teaching four acting courses this spring including two improv classes, an Understanding Theater class and an acting fundamentals class. Trautman is married to Diane Trautman, a city of Santa Clarita planning commissioner. The couple, who married in 1984, met at CalArts where they both studied acting. After living at various locations in Southern California the couple moved to the SCV in 1993. They have two grown sons, Jeff and Jacob. 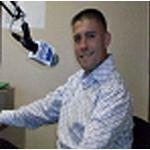 For more information on Trautman visit www.allantrautman.com.